HTC aims to Amaze at 4G speeds, but can polished hardware overcome cluttered software? Is the Amaze 4G actually amazing? or 4G? The Amaze 4G is a good phone, but it's far from amazing. T-Mobile may not be the best U.S. carrier, but the scrappy underdog continues to provide shelter for an assortment of Android handsets. 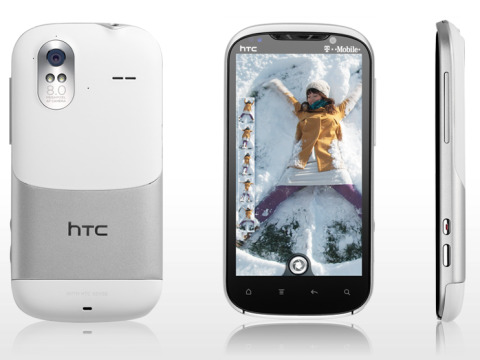 That includes the HTC Amaze 4G, which continues the trend toward larger displays in an effort to stand out from the crowd. T-Mo and HTC have thrown almost everything but the kitchen sink into this model, but is it enough to separate it from the pack? The first thing you'll notice when holding the HTC Amaze 4G is its solid build quality and how great it feels in the hand. Weighing in at 6.1 ounces and 0.46 inches thick, the handset is a direct descendent of the HTC Sensation, but takes advantage of T-Mobile's 42Mbps HSPA+ network speed to warrant the 4G branding. An aluminum frame wraps around the edges and spills onto the lower half of the back, available in either black or white (we reviewed the latter). The Amaze 4G has a 4.3-inch qHD touch screen at 960x540, which makes it physically smaller than the Samsung Galaxy Nexus, and a bit easier to hold and use with one hand. Pixel density junkies might be disappointed with the screen, but unless you're coming from an ultra-high density display (like that of the iPhone 4S or Galaxy Nexus), you'll likely find the 256 pixels per inch to be perfectly sharp, and the display as bright and color-rich as you could hope for. The entire back of the Amaze is one piece that pops off by pressing a notch on the bottom of the unit. A standard SIM card slot is perched vertically above the removable battery, with space for a micro-SD/SDHC card (up to 32GB) at left. The handset continues to work while the back is removed, so there's no need to power down for a quick SD card swap (the SIM card is blocked by the battery, so you'll need to remove it first). With the back plate on, the Gorilla Glass face is raised above the chrome frame at the left and right edges, bucking the current trend of smartphones where the display is recessed. Although the glass is larger and far more rounded on the edges, the raised face echoes the iPhone 4/4S. The HTC Amaze 4G has a somewhat unique button setup, featuring two camera buttons on the lower right side: One dedicated to video record mode (marked with a red line) and a second, larger button for still photos. A volume rocker rests at top right, which is a somewhat awkward position for right-handed individuals. It also doubles as a zoom control when in camera mode. The top of the device features a 3.5mm headphone jack and power button, with micro EXT/USB on the left. A two-megapixel front camera rests to the right of the earpiece above the T-Mobile logo, with a blinking notification LED to the left. The HTC Amaze 4G is available for a wallet-friendly $179.99 with two-year contract after a $320 instant discount and $100 mail-in rebate.